The Blazek sisters, Rosa and Josefa, were twins joined at the sacrum. Part of their stage act consisted of musical numbers in which they played duets on the violin. In 1910, the twins caused something of a legal controversy when Rosa gave birth to a baby boy. The father of the child wished to marry Rosa, but the courts denied the marriage on the grounds that it would be an act of bigamy. The sisters continued to tour for many more years, often appearing on stage with Rosa's son. 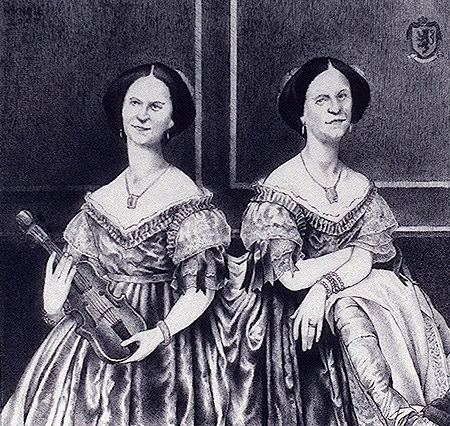 This portrait of the Blazek twins is based on the Jean-Auguste-Dominique Ingres portrait of Princesse Albert de Broglie from 1853.